There’s a bit of a kerfuffle going on about whether Momentum is going to launch a mass purge of the PLP. I doubt they have the organisational skills, however I was interested in just how long members of the PLP had served as MPs and what the politics of the Party were when originally selected. So I scraped a list of the parliament site and organised it as a table. This note talks about the profile of the longevity of PLP members, and which leadership made them. Further thoughts on the political consequences have put in the comments section. 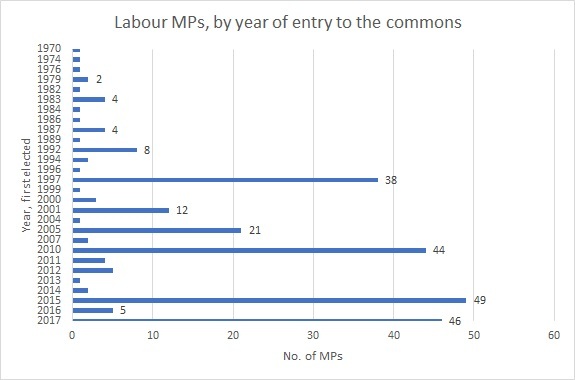 Here is a chart showing how many of today’s PLP entered the House of Commons by date of entry. Does this tell us anything interesting? Most MPs are elected in a General Election. Only 13% were elected at Bye-elections. This is important because the NEC has more power and the local party less when selecting candidates for a bye-election. Intakes are larger when Labour wins. Duh! The 46 new comers in 2017 is higher than I’d expected. There are a surprisingly high number of new entrants in 2010 under Brown’s leadership. There remain over 70 members elected under Blair’s leadership. Much of this is because of the newly won seats in 1997 although many of those are no longer in the Commons. i.e. the class of 97 remains large despite attrition from defeat, retirement and shamefully imprisonment. Over 25%, including Jeremy Corbyn and Dianne Abbot have served for 20 years or more, it includes all the ’97 intake elected in the Blair landslide. 45% of Labour’s MPs are women. 10 MPs are re-entrants; I have used the date of first entry. Labour won 12 bye-election between 2010 & 2015, but most were defences. 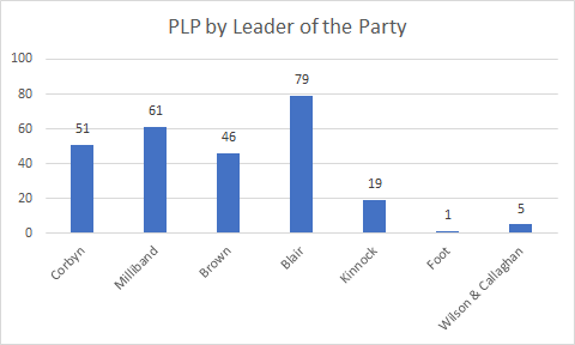 This next diagram shows the number of MPs in the 2017 PLP by my classification of the dominant leadership faction. It shows the overwhelming majority of MPs were selected under a right wing (or moderate) hegemony. We can also note that today the Party has close to 600,000 members today but we should remember that under Blair in 1997, the membership was nearly 400,000 but it didn’t last and by 2010, it had fallen to around 150,000. Sadly, its hard to know the average membership longevity of the Party nationally but it will be closer to two years than twenty. It has to be asked if these longer serving MPs still represent their local Parties. An alternative way of looking at this is by the Leader of the Party. I have uploaded the table I made here …. Please feel free to do stuff with it, if you do, it would be great if you posted a comment. Let’s face it, I was interested in how many of them could claim that their Labour Party mandate was still superior to their new membership. We should bear in mind that only one CLP has ever won a trigger ballot to get an open reselection. Even Danczuck was allowed to stand a second time. Kate Hoey who supports Fox hunting (in Vauxhall) and supported Leave, has been in Parliament since 1989, (28 years) and never needed to re-seek her mandate. John Woodcock, whose statements promising he would not support Corbyn as Prime Minister, while possibly supported by his local Party, was imposed for this election. (He was elected in 2010.) This is not a hit list, merely examples of people who might best be made to test their mandate as Labour’s candidates. (Maybe not Woodcock, but behaving as he promised would be grounds for expulsion.) The argument is that they have served a long time, and maybe should ask their local parties if there isn’t someone better. I enjoyed the piece that argues that local Labour Parties have a duty to ensure their candidate is the best available, and how can one know if we don’t test the candidate. Perhaps that’s an argument to be used during trigger ballots. We’ll never know if better behaviour, or a greater demonstration of unity, by Labour’s right in the PLP would have led to a better result. Tony Blair made his reputation by fighting the Left, it may be that part of Jeremy Corbyn’s appeal is his rejection of New Labour illustrated most powerfully by their opposition, and now his refusal to reappoint the ring leaders into his shadow cabinet. It is a problem of renewal and succession, although politicians don’t seem to do succession planning well, that so many of Labour’s MPs were made during the New Labour ascendency. One indicator of this weakness in intellectual diversity is that Corbyn himself is pre-Blair. This ideological sclerosis is examined in this article by Ed Straw on Labour List, and a white paper, hosted by me on my wiki, written by Emanuelle Averil which shows the brutal control exercised by New Labour and recognises that much of that machine is still in place. I have also bookmarked it at Diigo, and marked up a number of quotes from the white paper which identify the form of control as an inhibitor to intellectual renewal and membership control.